The new DLC for Marvel’s Spider-Man on PS4, The Heist, starts with a bang. A good old crime family bust in a sprawling stealth map. What’s not to love? As you make your way through the first level, thinking that nothing has changed so far, some of them start trying to escape, and you find yourself faced with the first addition. In this kind of battle, you have two things going on at the same time. People trying to kill you and people trying to get away (clearly marked with an arrow that changes colour depending on how close they are to the door). The problem is that you have to stop those that are trying to get away while at the same time watching out for – and of course, taking down – those who are trying to kill you. It makes for a somewhat fun challenge, even if it does feel like a slight waste of a map that feels like it was made for stealth. But the real party only starts when Black Cat – aka Felicia Hardy, an old friend who already left a trail during the main game – shows up. She’s gotten herself into some trouble and is working for the Hammerhead crime family. Crime isn’t a new look for her, but explicitly working for a crime family is. 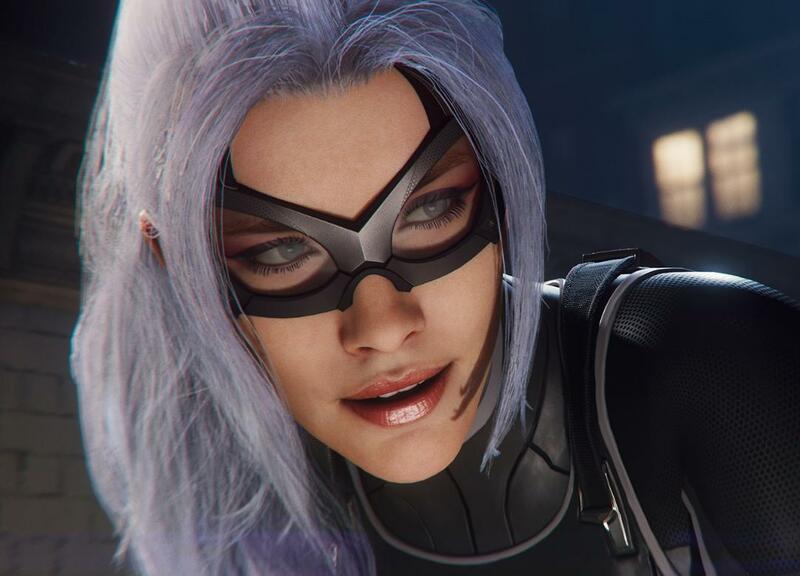 The short encounters between Spidey and Black Cat that always end in her getting away are the main focus of this DLC, including one or two team-up scenarios that let you choose which enemies Hardy should attack. As you fight off Mafiosi in these encounters, you’ll find yourself faced with a new type of enemy. It’s basically the same as the heavy enemy type, but with an added minigun. It can become quite the menace if you don’t pay enough attention to its firepower, but the good thing is that it can’t shoot for too long without the weapon overheating, giving you a quick break. Alongside the main story, some character building is peppered throughout while swinging through the city, specifically in the form of chats between MJ and Peter, as well as recently bitten Miles Morales wanting to learn as much as he can from the friendly neighbourhood Spider-Man. Of course, the will she/won’t she (tell the truth) back and forth between Spidey and Felicia leads to the main part of the story, whereas aside from one MJ section, the other stuff stays more in the background. The DLC also comes with its own set of side missions. Felicia Hardy’s father – the original Black Cat – hid a series of stolen artworks around the city and laced them with a radioactive isotope to make it easier for him to find them when he got back out of jail. The only problem is that that plan didn’t quite work out for him. Now, as the cop who worked the original Black Cat case is trying to clear up loose ends before they go into retirement, it’s up to you to find them. On top of that, Speedball is out of jail somehow, and back with a new series of challenges that will most likely get her put back in jail again. You know the drill: Complete the challenge, save the hostages, catch Speedball. Last but not least, the Maggia crime family has bases all around New York. Take these bases down the same way you would any of Fisk, Demon, Prisoner or Sable bases. The waves come at you and you stop them in their tracks. The side-missions are introduced as part of the main storyline, and you’ll find that these DLC side-missions are not available in the main game and vice versa. It helps you keep an eye on how much you’ve done of which part, and since the DLC takes place after the main game, it makes sense that way, too. You’ll still be able to find the backpacks and the landmarks in either one, thankfully, and the DLC doesn’t have particularly long side-missions, so you won’t be switching around all that much. Once you’ve finished the DLC side-missions, you’ll be swinging right back to the main game. Don’t expect a massive adventure with the Heist DLC as it’s fairly short, even despite adding a new series of side-missions. The main story comes with one fairly large-scale beginning mission and a few smaller missions as it goes on, some of which even mainly serve to introduce the side-missions. It still has the friendly neighbourhood Spider-Man feeling you know and love, but at the same time, it doesn’t really feel like it does enough to live up to the main game. The Heist is fairly short, even with its new side missions, and though it does have some cool character building, it ultimately doesn't match up to the expectations set by the main game.